Bichons have powder puff coats that require daily grooming. 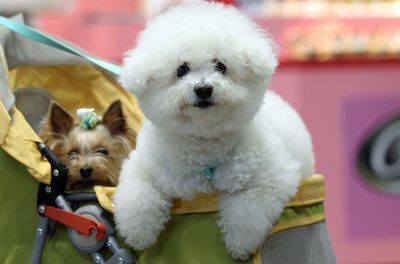 Bichon frises might be naturally affectionate, adorable dogs, but they are also considered a high-maintenance breed because their signature fluffy, white coats require frequent grooming. Most owners turn to professionals for major grooming sessions, but you can do several things at home to keep him looking nice between grooming visits. Brush your bichon daily with a slicker brush. Bichons have double coats, with silky, dense undercoats and coarse, curly outer coats. This breed doesn't shed, so it's necessary to spend up to 30 minutes a day brushing his coat to remove unshed, dead undercoat hairs that like to mat, knot and tangle. Brush your bichon with smooth, short strokes. Long strokes only groom the outer coat, leaving the undercoat hairs untended. Part and lift his fur, gently brushing it out in small sections starting at the skin and moving out to the ends of the hairs. Comb your doggy's face and behind his ears with a small, fine-toothed comb. The long ear hairs are particularly prone to knotting. Take special care when combing around his eyes and nose. Remove any mats you encounter during your brushing session. Hold the matted fur near the skin and gently pry it apart with a wide-toothed comb, starting at the bottom of the mat and working your way through to the end. Carefully cut out stubborn mats or tangles with blunt-tipped grooming scissors. Bathe your doggy once a month using a mild doggy shampoo. Wet his fur with warm water and work the shampoo into his fur. Gently scrub in small circles to remove any loose fur, debris and dirt. Rinse your dog with warm water until all of the soap residue is removed. Dry your bichon promptly with a clean towel to remove excess water. Finish drying him completely with a hair dryer set on a cool temperature, brushing with a slicker brush as you dry. Avoid letting his coat air-dry because it makes the hair droop and turn inward as it curls. Use a damp cloth to remove discharge or tearing streaks from around your doggy's eyes as needed. Treat severe tear stains with a commercial stain remover recommended by your vet. Trim your pooch's nails during his monthly bathing sessions. Avoid unintentionally cutting down too far into the quick by just trimming the very end of his nails. Use a doggy nail file to finish shortening the nails and smooth out the rough edges. Keep treats on hand to reward your doggy for good grooming and bathing behavior. Gently place cotton balls in your dog's ears before bathing to keep the water out of his ears. Don't forget to take them out when bath time is over! Always remove mats promptly because they trap moisture close to his skin. This can cause painful sores and skin diseases to develop. 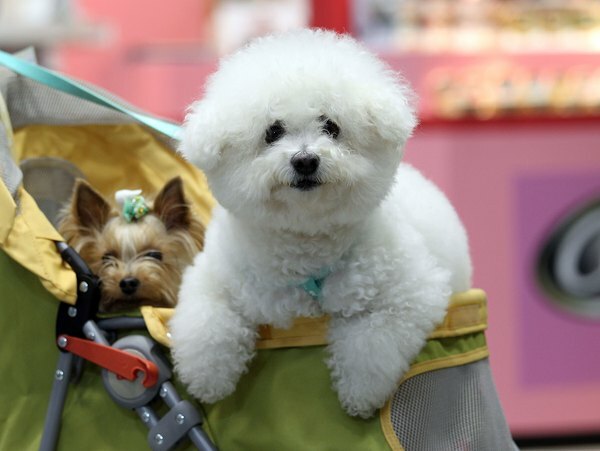 Avoid bathing bichons more than once a month. Members of this breed commonly suffer from sensitive skin that dries out with too many shampoos. How Often Can You Give Your Bichon Poo a Bath?